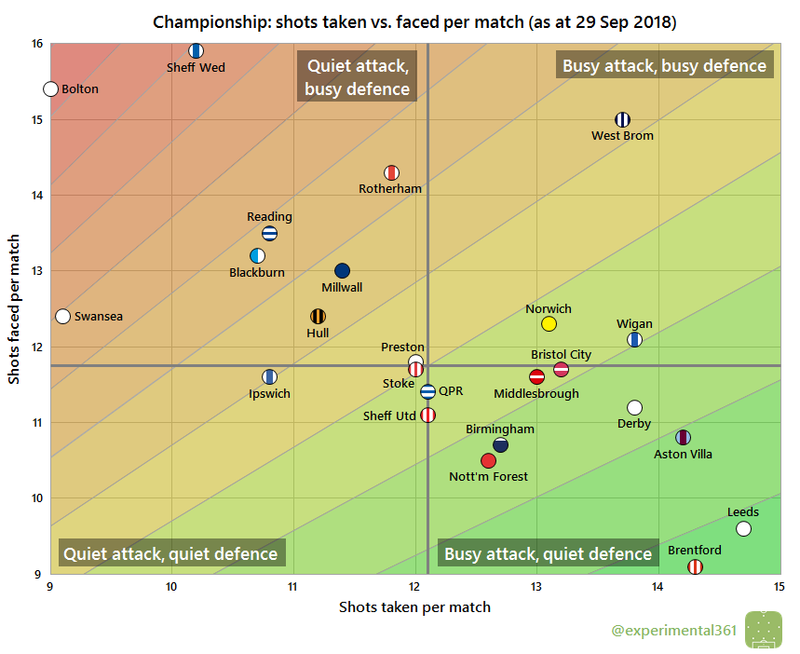 With the majority of EFL clubs now having played 10 matches this season, it’s time to switch the scatter graphics back on in full. These compare the attacking and defensive performances of every team in a division. Each of the four graphics is explained briefly below and at length here. 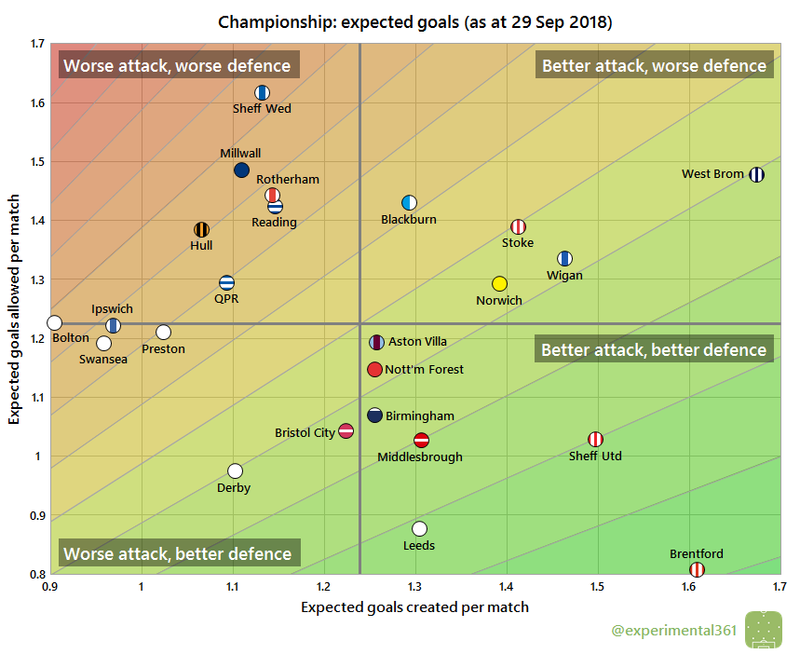 Leeds and Brentford have been the most dominant teams in raw shot terms, with Aston Villa and Derby also both bossing matches in a way that’s more encouraging than their league positions would suggest. West Brom are the division’s entertainers so far, with an average of almost 29 shots in each of their matches compared to the relatively dull 21 or so you’ll have seen in Swansea games. Sheffield Wednesday and Bolton look worryingly off the pace here. 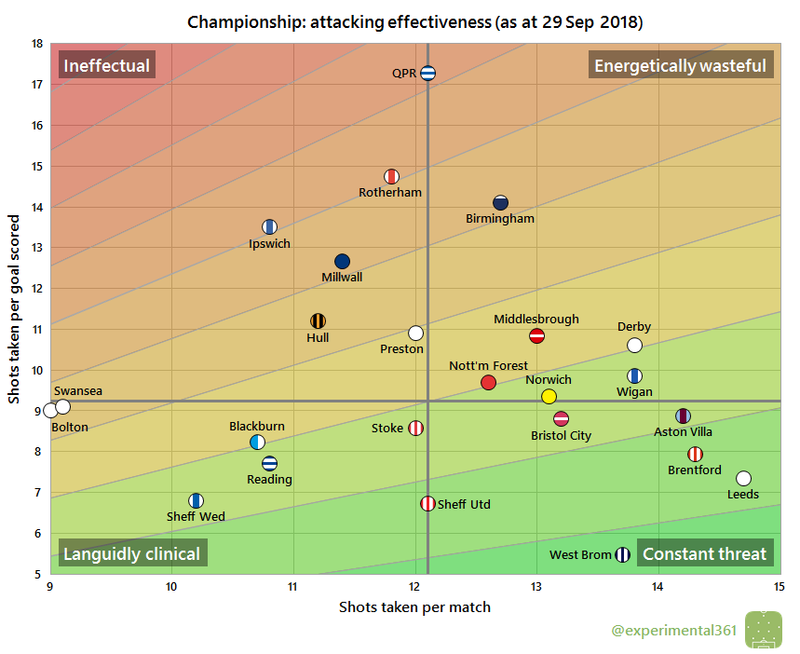 While Sheffield Wednesday aren’t rattling in a lot of shots, they’re making their relatively low number of efforts count: only free-scoring West Brom have been more clinical so far. QPR are having a nightmare in front of goal, as despite creating a respectable number of chances they’ve been almost twice as wasteful as the average Championship side. Tony Pulis’ Middlesbrough are breaking the graphic at the moment, with an insane 29 shots faced for each goal conceded: pretty much three times the league average. Swansea’s own miserliness at the back is also very impressive, although I’d expect both teams to drift back towards the average a bit over time unless something really special is going on. Bottom side Preston haven’t actually allowed opponents that many opportunities, but have struggled to keep the ball out of their net. 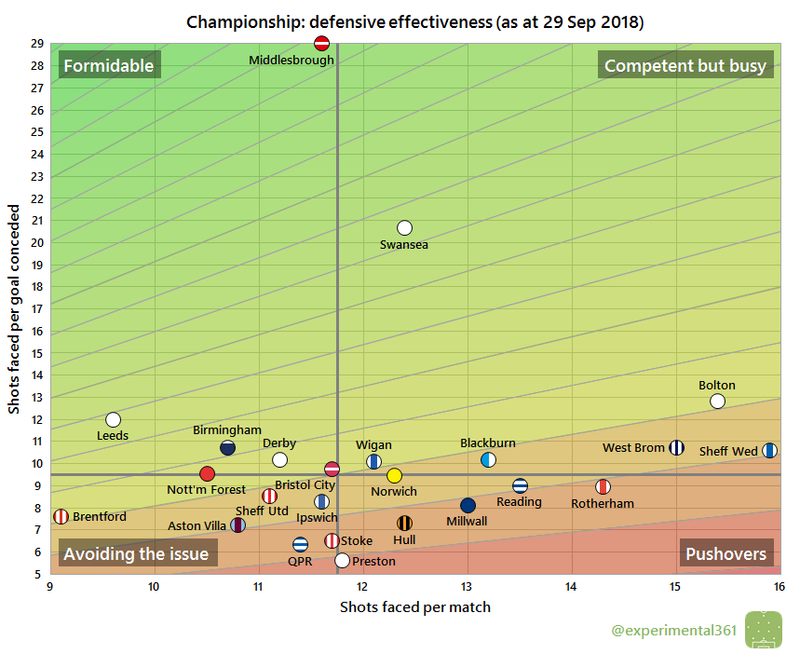 Despite a few recent setbacks, Brentford still look to be the most impressive team in the division overall, with honourable mentions going to Leeds and Sheffield United who also look pretty strong at both ends of the pitch. While West Brom look to be playing an attacking style that leaves them open at the back, Derby appear to be doing the exact opposite.